Matt Gray, as Chief of Sustainability, is responsible for advising the City on policies related to sustainability and the oversight of the Office of Sustainability; leading coordination of the Sustainable Cleveland 2019 initiative; implementing the Cleveland Climate Action Plan and the Sustainable Cleveland Municipal Action Plan; and reducing the City’s ecological footprint with solutions that also save the City money. In this role, Matt and the Office of Sustainability are working to improve environmental, economic, and human health for all. Key strategies including applying for and managing grants, assisting Departments and Divisions in implementing sustainability projects, holding Sustainable Cleveland Summits and other events, collaborating with community partners, and making it easier for Clevelanders to take action in sustainability. The result is a community working together to build a thriving green city on a blue lake. Prior to his work for the City, Matt held several positions related to sustainability and climate action in the public, private, and non-profits sectors. Before starting with the City in 2012, Matt completed a U.S. Fulbright Fellowship in Mauritius on climate change governance. 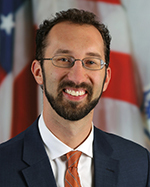 Prior to receiving this grant, he worked four years with the US Department of Energy's Federal Energy Management Program, serving as Chair of the Interagency Sustainability Working Group to make green building standard practice throughout the Federal government. Matt has also worked in energy management consulting, ecological water purification and for conservation organizations. Matt earned bachelor degrees in Industrial Engineering and Anthropology from the University of Pittsburgh. He also received a master’s degree in Public Administration from Columbia University, with a focus in Environmental Science and Policy.